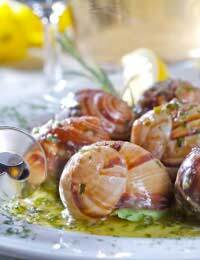 French cookery is highly regarded throughout the world. Its impressive heritage intimidates many novice cooks but its current form is the result of hundreds of years of continuous modifications and improvements. No cuisine exists in isolation from the rest of the world and the French passion for food has proved itself more likely to embrace new ingredients and cooking styles than to reject them. The degree of diversity in regional cooking styles is a testament to the incredible variety of foods produced and sold locally. Seafood is a speciality along the Channel coast, strongly flavoured meats are common near the German border, Basque cookery has influenced the cuisine of the southwest and cereals, vegetables and fruit overflow from the fertile valleys of the Loire, the Rhone and the Dordogne. The academy kitchens of Paris have grown world famous drawing on this amazing range of natural bounty. French cuisine is characterised by a couple of specific features. First and foremost is simplicity. Where the dishes of other cuisines might put together lots of ingredients with a broad spectrum of flavours, in French cookery the object is to put the focus on the specific flavour and texture of each individual ingredient and how it complements the flavour and texture of just a few other, carefully selected ingredients. The idea, broadly speaking, is that the quality of the ingredients and the technical skill involved in choosing and preparing them should be able to speak clearly for themselves instead of competing for attention as part of a raucous chorus. This clean, elegant style has made French cookery the most influential of all European cuisines. The Michelin star remains the accolade of choice for superstar chefs. The second key aspect of French cooking is the emphasis on technique. Many French dishes have elements that require a certain level of technical understanding and expertise in order to prepare. This is particularly true of pastry, or patisserie, cooking which can involve creating elaborate edible architecture out of sugar, whipped cream and eggs. Many French sauces and salad dressings also require a more detailed understanding of how different preparation techniques alter the physical properties of foods. Infusing oils, reducing stocks and forming emulsions are all techniques used to intensify the flavour and texture of sauces and soups in French cuisine. French is truly the international language of food. From the terminology used for the different types of cut such as julienne (2mm wide matchsticks), macedoine (5mm cubes), paysanne and brunois (2mm cubes) to the names for meats such as pork, mutton and beef, French dominates our culinary consciousness. Everyday words such as dessert, menu and buffet as well as expressions such as hors d’oeuvre, and cordon bleu often crop up in conversations about food. It is not deemed necessary for the English language to have its own word for mirepoix – the word for the mixture of two parts of diced onion to one part of diced carrot and one part of diced celery that forms the essential base of so many French dishes. Many of the current conventions of French cooking were formalised by the great Auguste Escoffier, often called the grandfather of modern cuisine, in the early 20th century. Escoffier was part of a long sequence of chefs modernising and reworking the ideas of previous generations and despite his legendary temper it is unlikely that he thought his ideas would be set in stone. The fact that his recipes are still being used today is a sure sign that he knew what he was talking about although modern dietary sensibilities often conflict with the luxurious food that he loved. The collected wisdom of French ‘haute cuisine’ that Escoffier represents is a treasure trove of useful information for anyone from any background who intends to learn how to cook. Bouillabaisse is a thick stew of fish and other seafood originating from Marseille. Coq au Vin is chicken braised slowly in red wine, making it tender and full-flavoured. Salad Niçoise is made with anchovies, olives, green beans, boiled egg and tuna. Vichyssoise is a smooth leek and potato soup that is served cold.